This simple program written in Basic4PPC allows you to calculate the perimeter, area and volume of different spacial figures (Sphere, Cone, Cylinder, Cicrle etc.). 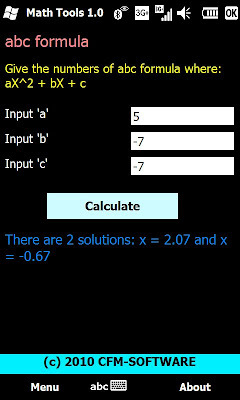 The program also includes a abc-formula calculator. The program is multi-language: English, Dutch en German. The program is open-source. The source code is included.